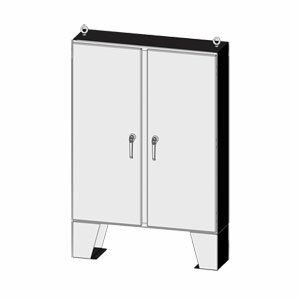 The SCE-ELSSLP series outdoor electrical enclosures are designed to house electrical and electronic controls, instruments and equipment in areas which may be regularly hosed down or are in very wet conditions. These electrical control panels provide protection from dust, dirt, oil and strong jets of water. This outdoor electrical control panel is the solution for waterproof and weatherproof applications. Keylocking Handle for Enviroline series Enclosures. Padlocking Handle for Enviroline series Enclosures.